2018 RAKC Was A Record Breaker! The 2018 RAKC was a HUGE success!! In addition to a great week-end of vintage and Pro/Am racing, RMVR achieved some amazing results at this year’s RAKC event! Our biggest fundraiser yet! RMVR raised over $220,000 to fund pediatric cancer research, allowing us tosurpass the cumulative $1,000,000 donation mark! One of our largest field of cars, with 129 cars registered, including 45 Formula Fords! 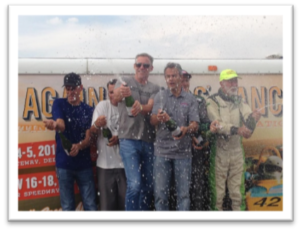 Eight Pro drivers (5 new to RMVR and the RAKC) gave up their week-end to join us for our Second Annual Schomp ProAm Challenge, with Team Paul Gerard (The Stig) and Brent Kaufman taking the top spot on the Podium. Everyone had a blast and wants to do it again next year!! Increased visibility for RMVR and RAKC, with participants from Texas, Arizona, New Mexico and Illinois! “ticket to ride”. Seeing the smiles on their faces was truly heartwarming. These results are simply fantastic!! We don’t know how high we can go… but let’s find out in 2019! !